Created, designed, and built by Nikolai Zykov in 2009. Puppet form: "free two rods" self-luminous object puppet with one reconnecting rod. 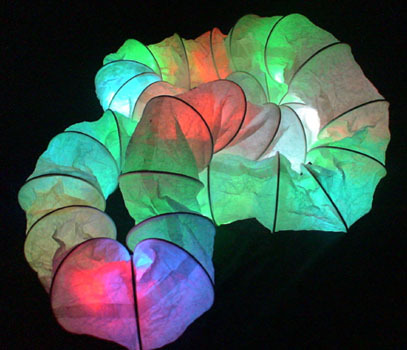 Length: 2 m / 7 ft.
Materials: paper, diodes, electric wire, fiber plastic. First presentation - June 4, 2009, GlavUpDK Concert Hall (Main Administration for Service to the Diplomatic Corps under the Ministry of Foreign Affairs of the Russian Federation), Moscow, Russia.